Mindika Moments: One Year Blogaversary! 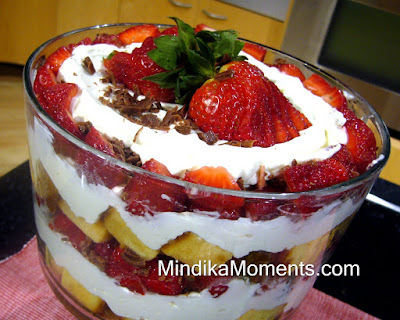 Today I appeared on Studio 5 to demo my Strawberry Cheesecake Trifle. Thanks to all who tuned it! If you didn't get a chance to see it, check out the video below. This was the very first recipe that I ever posted on my blog and since April marks my one year blogaversary (is that a word? ), it was a fun commemoration of how far my little blog has come. When I first started I was so excited when 30-50 people checked in each day. Now I can hardly believe when I see my numbers soring in the hundreds and even reaching over a 1000 on some days. I thank all of you out there that share in my love of cooking and life. Knowing you're out there and that you're interested in what I have to share, is encouraging and keeps me plugging away at this project! From the bottom of my heart, THANK YOU! 3. Drain juice off the strawberries and drizzle onto the cake cubes. Can't wait! Have fun on the show today. Watched you on Studio 5 today. You did fabulous. My husband tried maintain his cool, but he was almost begging me to make your strawberry shortcake trifle. I'm anxious to give it a try and I'm glad to have found your blog. Ooh, can't wait to try this!!! And that cauli-rice sounds fantastic! I'm going to pass that along to some of my clients. Thanks ! I saw this on Studio 5 and I finally get the excuse to make it for Father's Day. I am sure that it will be a big hit. Thanks for the recipe!